Combining a timeless appearance with a natural patina and time-tested performance that can last generations, RHEINZINK offers architectural grade zinc roofing products in CLASSIC® bright rolled, prePATINA® blue-gray and graphite-gray, and artCOLOR® in an array of colors. Suitable for commercial or residential projects, designed in traditional or modern architectural styles, RHEINZINK roofing system applications include double lock and single lock, interlocking tiles and batten seam, roofs. 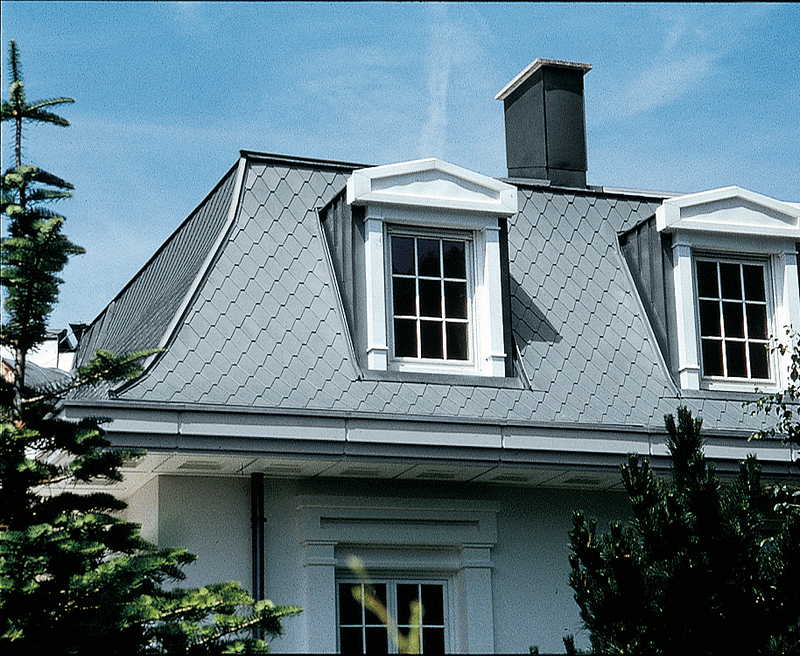 Often preferred for steep-sloped roofs, RHEINZINK products also work well on valleys, hip and ridge caps, drip edges, step flashing, dormers, cupolas, parapets and more. "Zinc's design flexibility, longevity, sustainability and natural beauty make it a highly desirable product for roofing," said Lisa Colaianni, RHEINZINK's marketing manager. 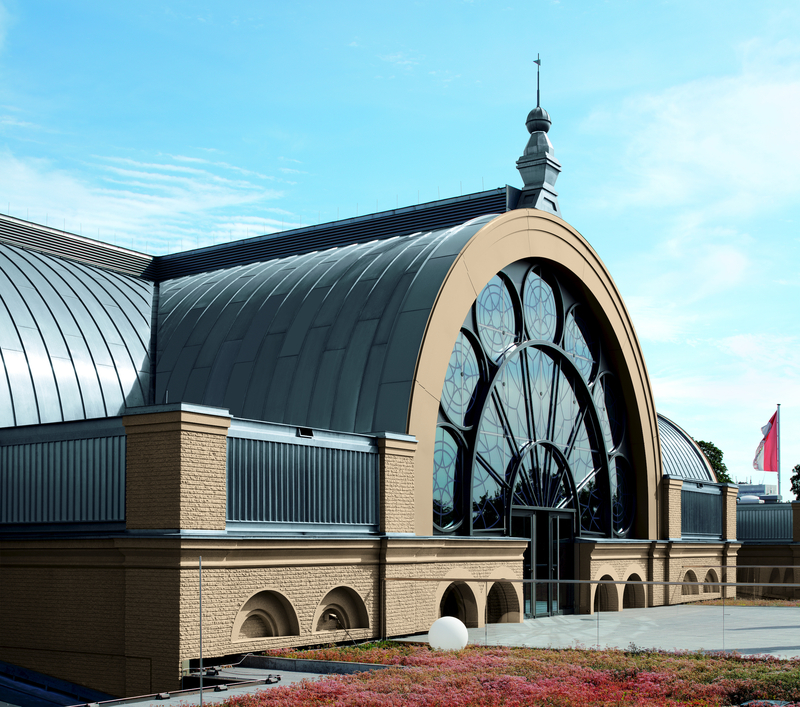 "Used in Europe since the 1800s, zinc roofing relies on a time-proven, dependable material and provides an attractive patina as it ages. Zinc's character constantly evolves in its depth, complexity and rich appearance." For a pre-weathered patina, RHEINZINK prePATINA products are specially processed to begin achieving this aesthetic prior to installation. * Double-Lock Standing Seam pre-profiled panels are ideal for roof pitches greater than 5/8:12, for creating curves and custom shapes, and for integral snow-retention or photovoltaic systems. 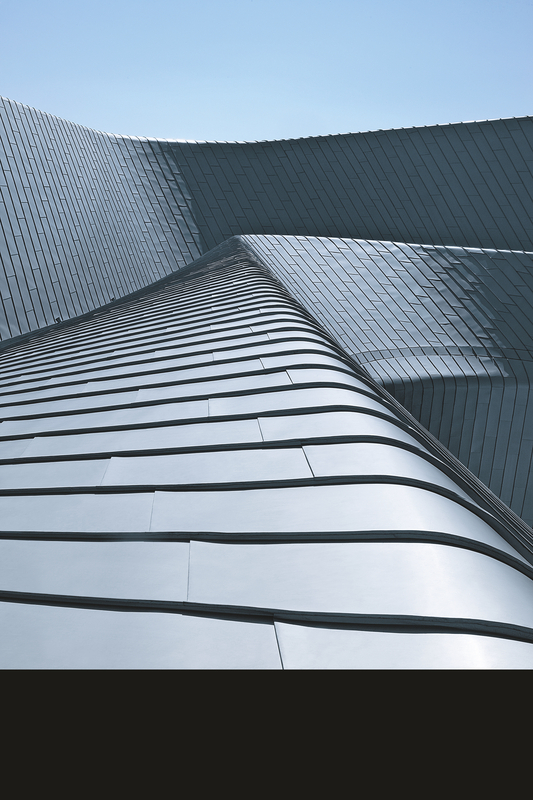 * Angle-Lock Standing Seam panels offers distinctive lines and shadows with a wider profile seam than the Double-Lock, and also can integrate snow-retention or photovoltaic systems. Along with a conventional vertical orientation, the panels can be installed horizontally or diagonally, and on rounded parapets or mansard roofs, and on roof pitches greater than 6:12. * Batten Seams are used in traditional wide-seamed applications, as an alternative to Double-Lock Standing Seam or in combination with standing seam panels. Available in up to 60-foot lengths, the batten seam panels form the boxlike joints by lengthwise connections with a wood batten or a RHEINZINK galvanized steel clip. * Interlocking tiles are individually sized in diamond and rectangular shapes to create a unique aesthetic for roofs with complex geometry, with curvilinear surfaces and with roof pitches greater than 3:12. 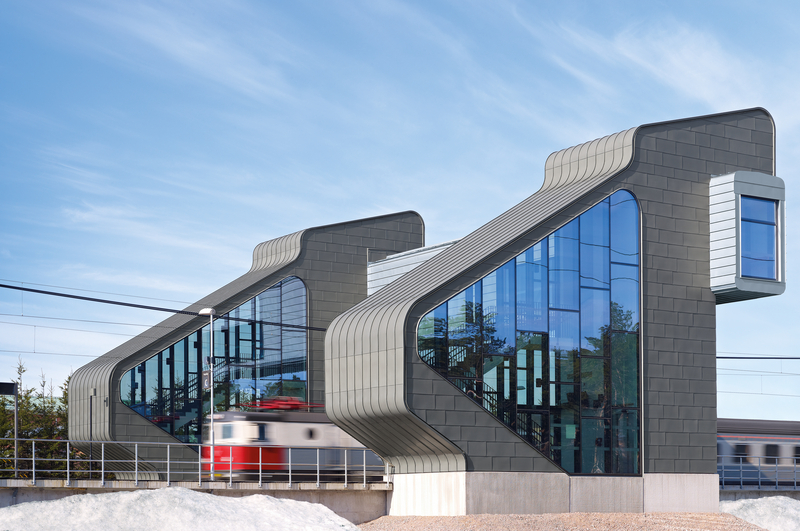 Complementing these roofing solutions, RHEINZINK also offers pre-fabricated half-round gutters and round downspouts, façade cladding and wall products, as well as ornamental and interior applications. Zinc's natural metallic properties contribute to RHEINZINK products' self-healing, low-maintenance, corrosion-resistant performance and a potential lifespan of 100 years or more. At the end of its useful life on the building's exterior, it remains 100 percent recyclable. All of RHEINZINK's products rely on high-grade zinc with trace elements of titanium and copper. RHEINZINK products meet the ASTM standard specification B69-16 Architectural Rolled Zinc Type 1 and Type 2. Currently, RHEINZINK is the only manufacturer with a Type 2 designation, which was received for its prePATINA graphite-grey alloy. RHEINZINK prePATINA products derive their color based on their alloy. For those seeking alternatives to zinc's natural aesthetic, RHEINZINK artCOLOR products are available in a choice of standard and custom colors of architectural coatings. To learn more about RHEINZINK roofing products, please visit https://www.rheinzink.us/systems/zinc-roof-and-gutter-systems/.